Todays beauty post is a real treat especially if you've ever experienced a facial using ESPA products. Total luxury and just total goodness for your skin. 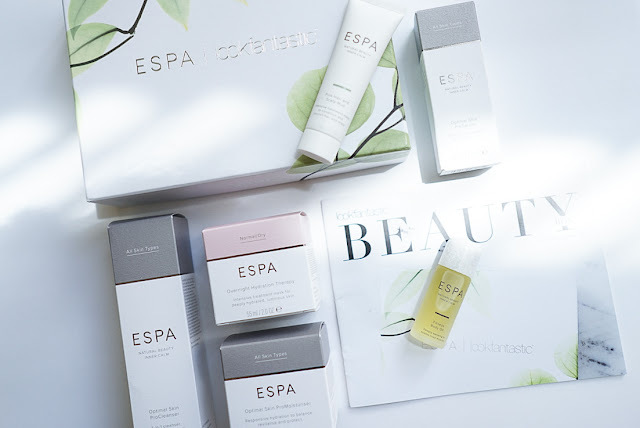 Ive always found ESPA products to be gentle but effective on my skin. This limited edition box would be a dream gift for a skincare addict to get a feel for the brand. In the box you find 4 full size products and 2 deluxe samples for $95.50 bargain!! Keep on reading to see what products are included. Optimal Skin Procleanser | I pulled this cleanser out straight away and added it to my skincare routine. This is suitable for all skin types and its also a 3 in 1 product, cleanse, exfoliate and mask. I would say it has a medium exfoliating texture if you know what I mean? Perfect for daily use, super gentle at buffing away dry skin and old make up. Smells exactly like Emma Hardie's cleansing balm which is gorgeous! Optimal Skin Promoisturiser | The packaging is to die for on the moisturisers, they have a marblesque lid and overall minimal luxe feel. Again this is suitable for all skin types. The consistency is very lightweight almost gel like and absorbs very quickly into the skin, fresh airy scent perfect for daily use. Optimal Skin Proserum | Hands up of you're a serum addict?? This serum is quite intriguing as one of the illuminating ingredients is turmeric and I don't think I've ever used a product with turmeric in before. Bottle is extremely luxurious and I can not wait to give this serum a go, maybe I'll do a full review once I've used it for a few weeks. If you've used this before let me know how you've got on. Overnight Hydration Therapy | The formula is rich and creamy and it smells like a lavender dream. Lavender is my fave scent and this one is great, not too overpowering but enough to gently relax you and your skin before bed. Promises to restore soft, supple glowing skin by morning. 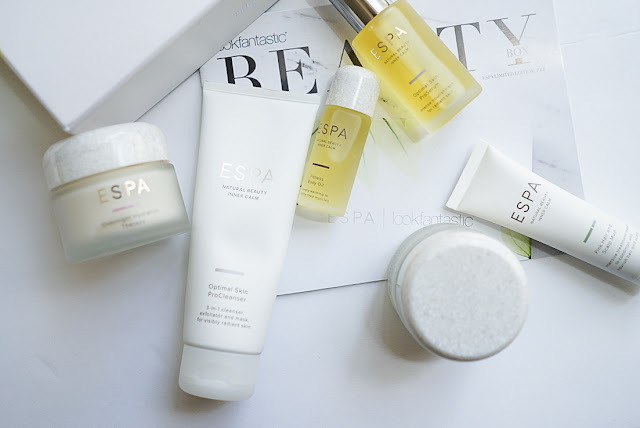 Pink Hair And Scalp Mud | This deluxe sample was a lovely surprise as I didn't know ESPA did anything like this. I love using hair masks and can not wait to try out this pink mud mask. I always apply my masks to damp hair 20 mins before I shower to optimize results and this is how I plan to use this product. Fitness Body Oil | I love the sound of this soothing fitness oil! Enriched with lavender, sweet almond oil and clove to relax and sooth tired muscles. This is going straight in my gym bag! They also offer a Fitness Bath Oil which sounds dreamy! I did mention at the beginning of this post that this beauty box is a bargain for $95.50 and it really is! The serum alone is $90 so if you want to explore ESPA snap up this limited edition box here before they're gone.